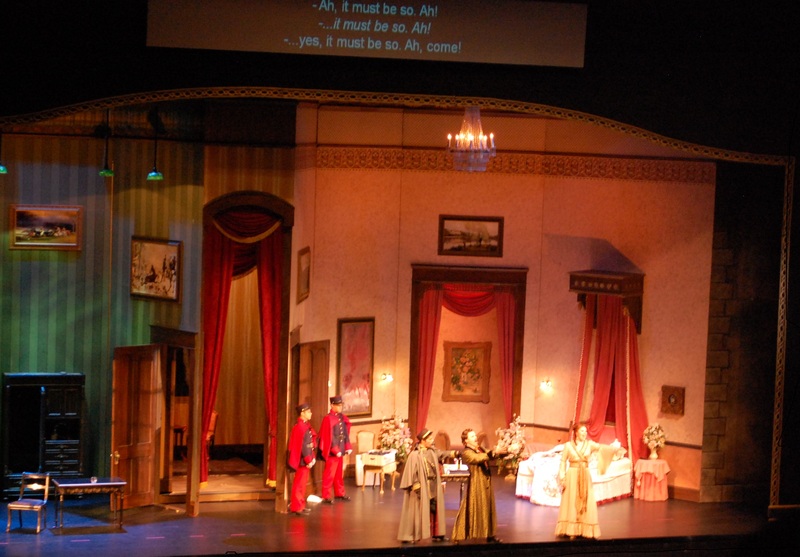 Die Fledermaus – a very fun opera! 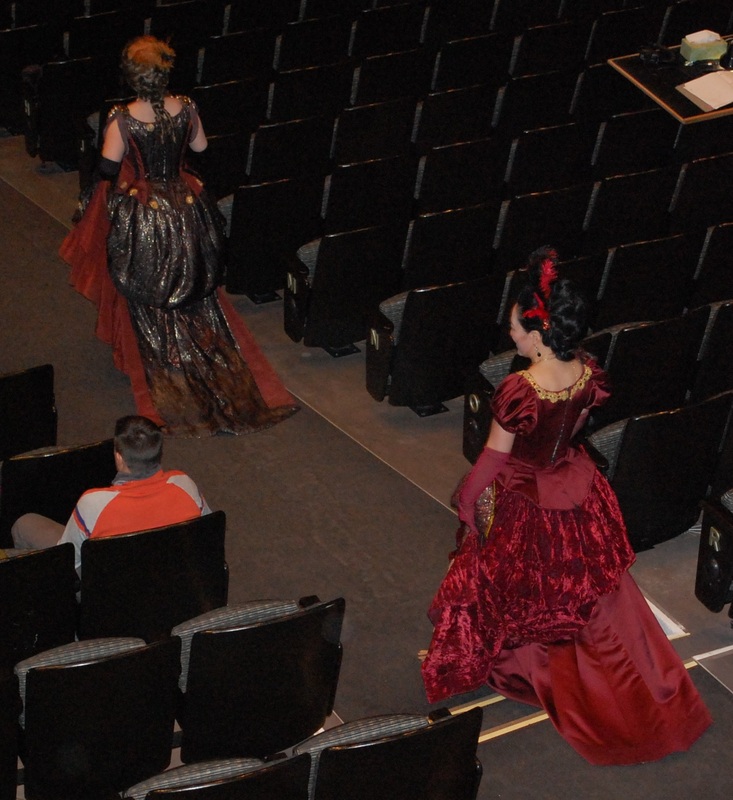 The Edmonton Opera is currently performing Die Fledermaus, the light comedy written by Johann Strauss Jr. The music is very waltzy with catchy almost-familiar tunes, as you might expect. The story is silly, the characters are clever, funny, and not too complex, and the sets and costumes are delightful. In this production, all the singing and spoken dialogue is in English. The song lyrics are displayed on the supertitles the same way they are for operas in other languages. All of this makes it a very accessible opera experience. I was fortunate to be offered a chance to attend a dress rehearsal with members of the media and with a lot of school children. The children sitting near me seemed to love it, laughing at the physical comedy, cheering at the curtain call, and even making “rock on” signs with their fingers. There was a lot of snickering when one character sang that she hoped the party would be gay. The story is full of complications and cheerful deceits. It has all the elements of a successful farce – a chambermaid with social and theatrical aspirations (Jacqueline Woodley, whom I saw as Miliça in Svadba last year), a marriage with both partners restless (Gordon Gietz and Betty Waynne Allison), an incompetent lawyer (Aaron Ferguson), a bed to hide under, and lots of doorways to pop in and out of. It also has lots of music, about equally mixed between catchy singable waltz rhythms and what I think of as classic opera solos without significant rhythm, rhyme, or repetition. The plot is full of broad dramatic irony and sarcasm. Count Orlofsky (Gerald Thompson) was a counter-tenor with an astonishing vocal range and spot-on comic timing. There are two more performances, Tuesday and Thursday evenings this week. Tickets are available on line, and parking at the Jubilee Auditorium garage is free. Choris members stroll towards the stage at intermission before party scene. This entry was posted in Opera and tagged die fledermaus, opera, stewart lemoine on February 2, 2014 by Ephemeral Pleasures.